Ignite a dazzling marketing campaign and boost your sales with the Prism Standard Flint Cigarette Lighter. It has child guard features for improved safety. 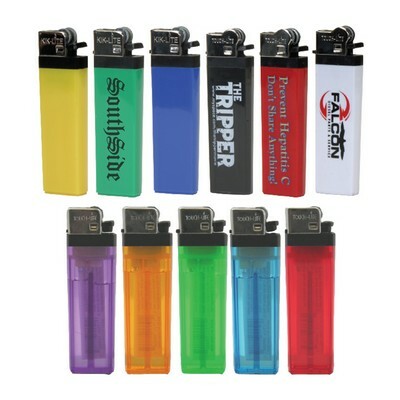 The lighters are compact and can be easily stored in pockets and purses. They are available in transparent red, blue, purple, green, orange, and solid white, black, red, blue, yellow, green colors, and make lovely souvenirs. Imprint your company’s logo on the lighter and give it away at trade fairs, campsites, tourist spots, and to any business in the candle, cigar, and incense industries to easily reach the masses and provide effective exposure for your brand. Dimensions: 3 1/8" x 1"